When boating in Wisconsin, you are required to have at least one U.S. Coast Guard-approved Type IV throw-able PFD, either a ring buoy or seat cushion, on recreational boats that are 16 feet in length or longer. In addition, you must have at least one wearable Type I, II, III, or V PFD for each person on board, regardless of the length of vessel. Make sure the wearable PFDs are readily accessible. Type V PFDs are approved but must be worn to be considered legal. Flotation devices that are ripped or in poor condition are not considered approved. All personal watercraft occupants must wear a PFD at all times. Wisconsin law states that the owner and/or operator of a vessel is responsible to carry, store, maintain, and use the safety equipment required by the federal safety equipment requirements adopted by the U.S. Coast Guard. Federal regulations require that children under 13 years of age, that are not in a cabin or below deck, must wear a PFD on all recreational boats while underway. In Wisconsin, it is illegal to operate a vessel or be towed by a device, such as water-ski, tube, or wakeboard, while intoxicated or under the influence of any controlled substance. A recreational boater with a blood alcohol content of .08% or more shall be presumed to be under the influence of alcohol. Wisconsin’s "Zero Tolerance" law prohibits persons younger than 21 from consuming alcohol and operating a vessel with any measurable alcohol level. All powered boats, including those with gasoline, diesel and electric motors, that are principally operated on Wisconsin waters must be registered with the Wisconsin Department of Natural Resources. Boat owners must have at least a temporary Certificate of Number, or registration, and expiration decals to legally operate a vessel on state waters. Once issued, the Certificate must be signed, carried on board, and available for inspection by an enforcement officer when the vessel is operated. The Certificate is valid for three years beginning on April 1st and expiring on March 31st of the third year. The WDNR must be notified within 15 days if the address of residence changes, or if the boat is stolen, destroyed or abandoned. A transfer of the boat ownership terminates the certificate of number and title. The new boat owner will apply through the WDNR within 10 days following the transfer and prior to boat operation for a new title. If you lose or destroy your Certificate of Number or decals, you must apply for a duplicate along with a processing fee. 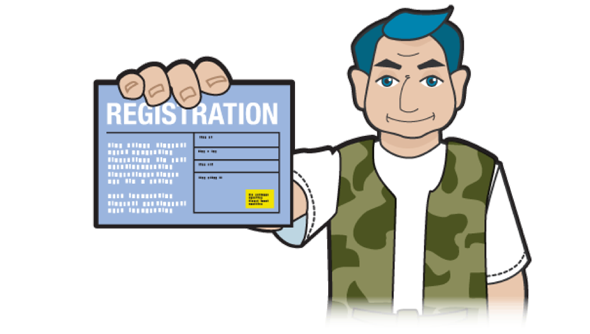 For more information on registering your watercraft, contact the Wisconsin DNR. 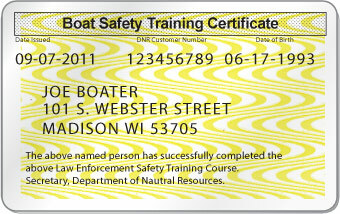 When you register your boat, you will receive a Certificate of Number, assignment of boat numbers and a decal. Separated from the letters by a space or a hyphen. For example: WS-5697-JL or WS 5697 JL. It's important that your boat is properly marked and documented, and to keep your papers with the boat. Failure to comply with this requirement can result in delays and fines. Refer to the following chart for a list of registration fees. Non-native aquatic species, plants, fish and animals are invading Wisconsin’s waters. Aquatic invasive species can be accidentally transported and introduced by recreational boaters by being attached to propellers, intakes, live wells, bilge areas, trailers or hulls. These pests can increase dramatically under the right conditions, displacing native species, clogging waterways, and impacting navigation and recreation. Once introduced, they are nearly impossible to eliminate. species from one body of water to another. Remove aquatic plant and animal materials from your boat before leaving any body of water. Flush raw-water cooling systems and clean sea strainers before moving your boat from one body of water to another. Empty bait buckets and remove any plant fragments from bait wells, fishing gear, trailers, dive gear or props. Dispose of such items into a garbage receptacle on land. Drain water from your motor, live wells and bilge. Report new infestation of non-native aquatic species to the Wisconsin Department of Natural Resources. As you learned in Chapter 7, personal watercraft are very powerful for their small size and demand the same respect as any boat. In fact, PWC operators must follow the same rules and regulations as any powerboat operator, including registering the watercraft with the state and carrying a B-1 class fire extinguisher on board. The following are additional regulations that must be followed when operating a personal watercraft in Wisconsin. It is prohibited to operate a PWC between the hours of sunset and sunrise. The operator and all passengers of a PWC must wear a PFD. When towing someone on a tube or on water skis there must be capacity on the PWC to accommodate the operator, the observer and the person being towed. PWCs must be operated at a distance of 100 feet from other water skiers or others being towed behind a vessel. Within 200 feet of shoreline on all lakes, reservoirs, and bays. PWC operators must not exceed slow-no wake speed when approaching within 100 feet of any boat or vessel. Operating a PWC between the hours of sunset and sunrise is prohibited.